I've always thought it a bit bizarre how people overreact over a famous person's death and take it so personally, especially when they have never even met the person but I have been deeply saddened by MJ's death as I grew up on his music and still can't believe that we won't be seeing him moonwalk for the last time. 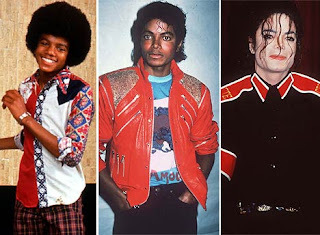 Not only was he a musical genius, a revolutionary dancer but a style icon in his own right (I didn't even realize how much people jacked his style until I saw the video for "Bad" on TV again. Two words - Russell Brand). As my own tribute, I was going to create MJ inspired looks on Polyvore but it doesn't seem to be working today (I might try again tomorrow). So I leave you with a photo of his changing style and recomend you watch the live coverage of the Memorial Service right now.